The legendary Adnan Othman has long been a driving force in the Malaysian rock scene. As early as the 1960s his groundbreaking songs in the style known as Pop Yeh Yeh (rock and roll sung in Malay) attracted fans from across Southeast Asia. Recently, he has gained many new fans around the globe due to a renewed interest in rock music from this region. Adnan first rose to fame during the groovy Pop Yeh Yeh era (1964-1970) in Malaysia and Singapore and he continued to evolve as a musician and composer throughout his exciting career. He made his first recordings in Singapore in the early 1960s, when he was invited to record with a highly popular backing band, The Rythmn Boys. He produced innovative material well into the 1970s, but always stayed true to his Rock-and-Roll roots, even when many other artists were turning towards more predictable disco influences. Every track on this album, which draws from all eight of his solo EPs, reveals a different side of his personality. His forceful, gritty, and emotional lyrics and vocals are backed by such memorable Pop Yeh Yeh bands as The Rythmn Boys, The Wanderers, The Flamingoes, and The Falcons. This impressive collection includes rare photos from the artist’s own collection and a detailed biography, co-written by Adnan himself. This is a rare and personal insight into the life of one of Singapore and Malaysia’s most beloved Pop Yeh Yeh legends -- revealing the man behind the spotlight—one of the most humble, generous, down-to-earth people you could ever meet. 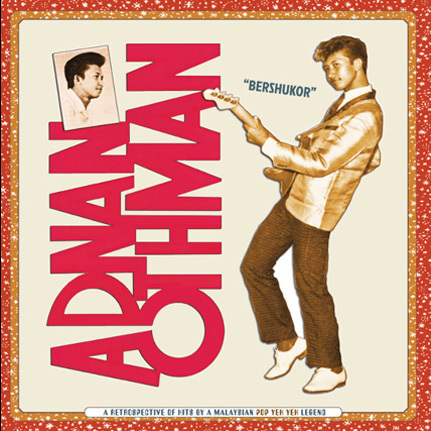 It is clear that Adnan Othman cares deeply about preserving the legacy of his fellow Pop Yeh Yeh musicians: he devoted much time and energy helping to develop the previous Malaysian rock-focused release, Pop Yeh Yeh: Psychedelic Rock from Singapore and Malaysia 1964-1970 (SF079, 2013). Again, for this album, he patiently answered our many questions about his life as a musician and artist, and we are most grateful to him for giving this release so much of his unique perspective. In fact, the title of this collection, Bershukor, named for one of the hits included in this album, means “gratitude” in Bahasa Melayu. The 26 unforgettable tracks on these two records are soulful, electrifying, and beautiful. To the many fans of ’60s Asian Rock and Roll around the world who have been waiting for an album dedicated solely to the music of Adnan Othman, here it is! Gorgeous 2-LP gatefold jacket with full-size color 8-page booklet of text and photographs.